DNG is a great format to store photos taken in RAW. But sometimes you need just JPG. When you need to send photos to a friend or a client that clearly wouldn’t know how to open a file in .dng format, or when you need to show photos and there’s no appropriate app on a computer. That’s when our online dng converter will come in handy. To convert images to JPG you need nothing but a modern browser (Chrome, Firefox and Safari). But the fact that raw.pics.io works in a browser doesn’t mean that something is being uploaded to the Internet. Your images are converted locally. And it's great! Besides, you can convert from native raw formats like сonvert RAW to JPEG. Most converters you’ll find on the Internet require registration or navigating through several web pages overloaded with ads. Desktop solutions always require installation. We made using raw.pics.io as easy as it can be. If you want to just convert some DNG images – you’re free to do it right now. This feature allows you to put a number of DNG files and get JPG file for each of that. 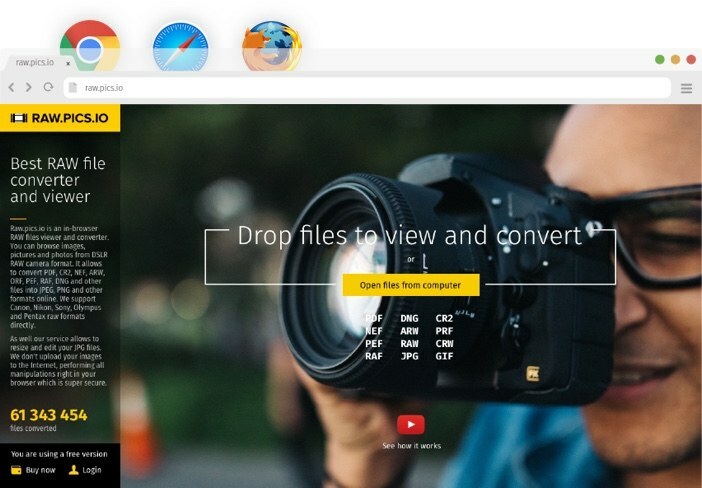 You need just drop your files into browser window and press 'Convert' button. DNG stands for Digital Negative. This is a universal RAW image format which was developed by Adobe in order to save digital photos in a generic, highly-compatible, and uncompressed format. In this respect, DNG is different from other RAW files that have specific formats based on manufacturer and camera type. How to open and view a DNG file? As long as DNG image format was developed by Adobe, it is supported by various software products produced by this company. The biggest disadvantage here is that they are not free and require installation. 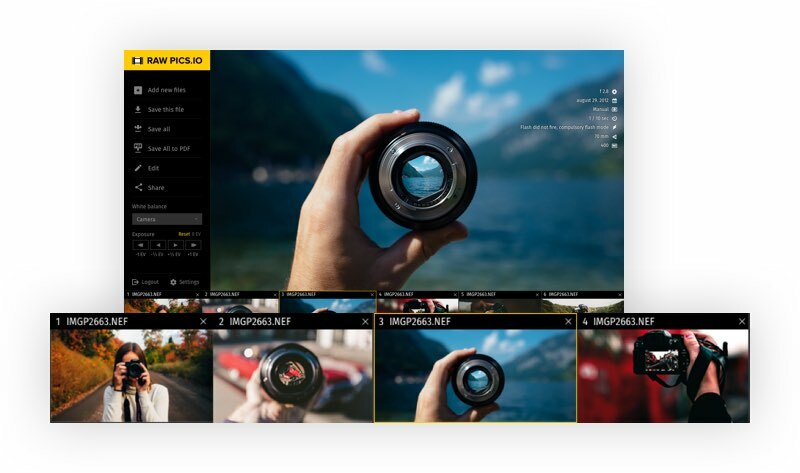 Besides, DNG images can be opened with several different image viewers, including the built-in Photos app in Windows and macOS. However, if you want not only to view, but also modify and convert DNG to more popular JPG or PNG file formats, you’d better use some of the available online raw converters, such as raw.pics.io. It’s totally free and it works in your browser, which is super secure. 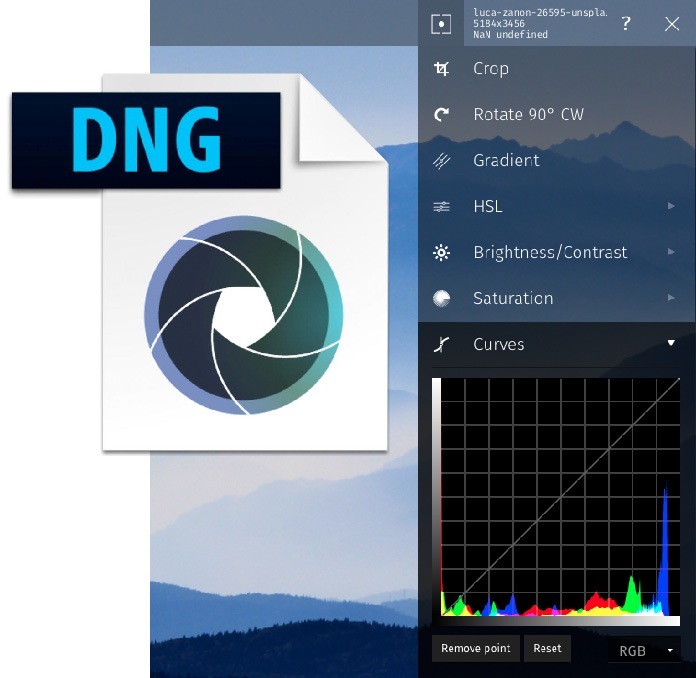 DNG is a great image format which contains raw image data and metadata that are needed to render an image without extra knowledge about the characteristics of the camera. This data can be modified with the help of online editor and convertor, such as raw.pics.io, and later saved into the file. Another advantage is that DNG files can be made smaller than other RAW files. And finally, unlike other RAW files, DNG format includes checksum information that helps to detect and prevent file corruption. For all its advantages over other RAW image formats, converting DNG into JPG, PNG or PDF is still a problem, unless you have specialized software at your disposal. Alternatively, you can use raw.pics.io, where you can open and convert your DNG files without restrictrictions. 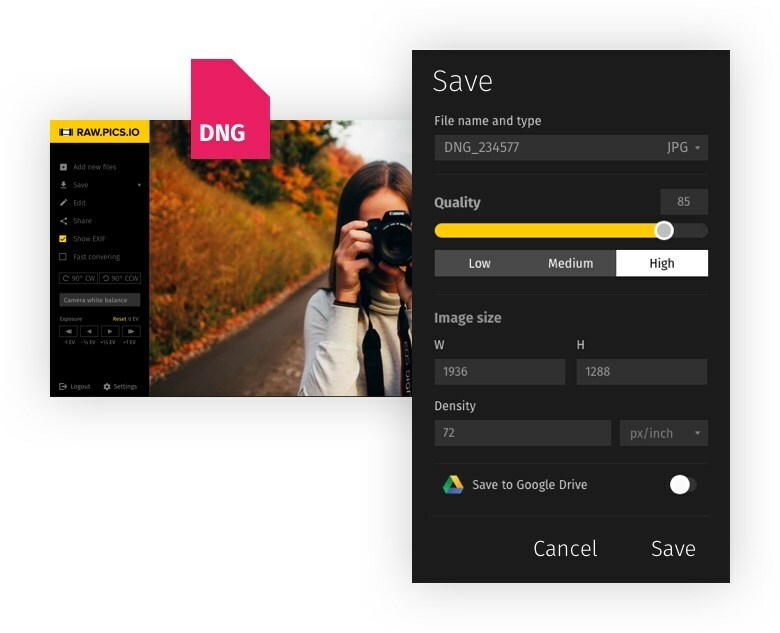 Want to convert some DNG files? 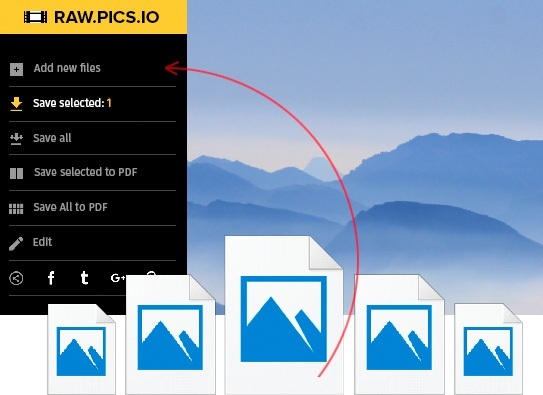 Online service http://raw.pics.io allows to convert DNG to JPG. This is a short tutorial showing its capabilities: batch conversion, resizing, raw decoding.